Our leave-in detangler naturally moisturizes your child's hair, preventing breakage and the occasional tear. 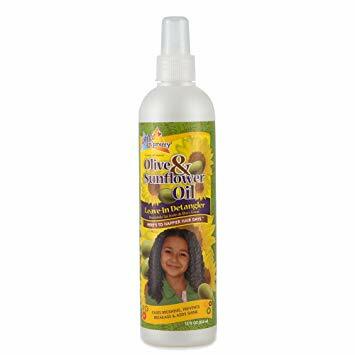 Olive & Sunflower Oils work together to ease the comb through her hair, while increasing manageability and shine. You don't have to worry about her hiding the brush from you ever again. For relaxed and natural hair. Our leave-in detangler naturally moisturizes your child's hair, preventing breakage and the occasional tear. Olive & Sunflower Oils work together to ease the comb through her hair, while increasing manageability and shine. Sunflower Oil: Loaded with vitamins and minerals to help relieve tight, itchy scalp dryness. Olive Oil: Promotes a healthy scalp, repairs damage & adds even MORE shine. Spray a generous amount on hair and scalp. For best results comb by starting at the ends and gently work your way up to the scalp.